and test preparation courses and tutoring for the MCAS, BPS Exam Schools, and college entrance exams. For Harvard to begin the work necessary to lay the foundation of a university-assisted school. Commissioner Tinlin: The construction management plan is overseen by BTD. BTD discusses it with the proponents. The developer has to develop a plan through this process and come up with a solution that provides the least amount of impact to the area affected. The construction management plan is not a formal filing. The public can comment and challenge the plan at forums like this community meeting. BTD’s charge is to keep impacts to a minimum. The construction management plan will also be monitored throughout the project. The City can shut down a project at any time if necessary. Bryan Glascock, Director, City of Boston Environment Department, then discussed the regulation of work hours. Regulations stipulate that construction hours are Monday-Friday from 7am – 6 pm. There is a process for requesting a variance from these hours. If the neighbors agree that they would rather the project be done quicker, then it is possible to extend the hours and/or days that construction is allowed to take place. Bryan explained that heavy construction tends to be much more noisy (such as driving piles, pouring concrete, etc), but there is also quiet construction work that can take place without any neighborhood impact (such as hanging drywall, installing finishes, etc.). The variance for construction hours is granted by the Building Commissioner, but he would want to know from the neighborhood if this would be beneficial. A notice would go out in advance to all neighbors and it would be coordinated with the Mayor’s Office of Neighborhood Services. But what do we get once contstruction starts? Harvard goes behind the community's back to get permission to continue construction work until 10:00 PM. The City lets Harvard do this with no public process. Ooops! Sorry! Rep. Wallace could have found a less denigrating way to express his concern about a possible increase in apartment units in his neighborhood. Maybe the next time Honan or Moran see him at the State House they could ask him to ease up on their home turf. Not long after the BRA approved plans to build 139 condominiums at 50 West Broadway, home of the former Cardinal Cushing High School, the developers went back to the BRA, seeking permission to build apartments, instead of condos. To the dismay of South Boston state Rep. Brian Wallace, the BRA approved the change. “I’ll never support that because we’ll become Allston-Brighton,” Wallace said, adding that he fears other condo developers will also switch to apartments, and his constituents will become transient students from area colleges, instead of homeowners. Occurred between 12:40 PM and 12:46PM 525 Harvard St. Victim reports that while she was walking down Harvard St. she was approached by a light skin Hispanic man, the victim said that the suspect demanded $20. The victim replied “no”. The man than brandished a knife and robbed the victim and in doing so ripped her coat with the knife. The victim described the man as being a light skin Hispanic between 20 and 25 years of age, clean shaven with short black curly hair and wearing blue jeans and a black jacket. Why do cyclists, pedestrians, and transit riders get short shrift in street design while cars continue to get all the attention? Hear in detail the typical arguments that transportation departments and their consultants make-- and where they've gone wrong. Get in on the secrets! Jeff will also talk about best practice for urban street design showing slides from around the US and world of successful and inspiring streets. In the words of the late European traffic engineer Hans Monderman, "If you want vehicles to behave like they are in a village, build a village." Stephen Joel Trachtenberg, former president of George Washington University, write on his blog about some of the zoning and neighborly issues related to university expansion and student-community interaction. He mentions BU, Harvard, and BC in passing and then describes "a renewed and growing trend on campus, the construction of crypts" at Duke, the Citadel, and elsewhere. Two stories about recent BC Master Plan meetings. In the Editorial it is suggested that students should have a role in the community/BRA/BC discussion about where undergraduate dorms will be built and how that will impact the neighborhood. The news story summarizes the many concerns and objections voiced at Tuesday's Task Force meeting. Brighton resident Mac Chinsomboon has left an interesting comment about his personal experiences applying for zoning variances for his home at 36 Shepard St and having his application denied. He has even posted his application and emails with the BRA at http://chinsomboon.com/omac/home/36shepard.pdf. Bob Van Meter, who has lead the ABCDC for the last 15 years, is moving on to the Greater Boston Local Initiatives Support Corporation. LISC helps resident-led, community-based development organizations transform distressed communities and neighborhoods into healthy ones – good places to live, do business, work and raise families. By providing capital, technical expertise, training and information, LISC supports the development of local leadership and the creation of affordable housing, commercial, industrial and community facilities, businesses and jobs. We help neighbors build communities. Big Belly Trash Receptacles - discussion of where and how they are placed around the city. 95 Everett St. - Request to change zoning to allow commercial (office) use for building formerly used for auto-body shop. The February 2008 discussion on TownGown World presents several viewpoints on zoning and licensing approaches from around the world to address issues of absentee landlords, residential overcrowding, and general neighborhood quality of life. Greenville, NC is enforcing an ordinance prohibiting more than three unrelated people sharing a dwelling - "Landlords, city reach settlement on over-occupancy suit"
Last September Duluth, MN banned new rental licenses if there is another rental within 300 feet. Boston City Councilor Michael Ross writes an article about allowing no more than 4 undergrads to live in a single off-campus unit. Anyone interested in a variety of ideas for how housing policy can help communities maintain and improve their quality of life for all residents will find plenty of thought-provoking ideas. How they design public spaces on the "other side"
Soon we will be working on a design for the new park to be created in Allston behind the Honan Library. Here is a chance to learn something about how public input and park design is being done for a similar project less than a mile away. In Cambridge where the Mahoney's Garden Center used to be (on the corner of Western Ave & Mem Drive) there will soon be a public park. This is part of the deal negotiated with Harvard for the residential development under construction in that area. The Cambridge Community Development Department is having to discuss the proposed design on Thursday, January 24th from 6pm-7:30pm at the Cambridge Senior Center 2nd Floor, 806 Massachusetts Avenue. New recycling bins and single stream recycling so we can put all of our recyclables (glass, plastic, paper, etc) together without any sorting. An unconventional idea in the world of transportation and public realm has cars, pedestrians, and bicyclists all together in roads without traffic lights, sidewalks, lane markers, and all of the other apparatus designed to control and seperate the various user groups of modern roadways. 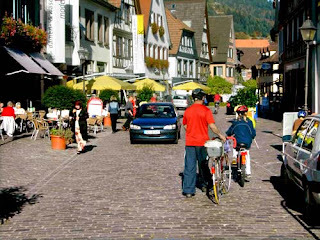 Its called "Shared Space" and an implementation in the German town of Bohmte was featured in a story on NPR today. Wired Magazine wrote a good story about this approach back in 2004 and it is another prism through which we can look at the transporation future of our community. Giles Li, founder of the Boston Progress Arts Collective and Arts Coordinator at the Boston Chinatown Neighborhood Center, shares some thoughts on Harvard's approach to Allston at http://gilesli.com/. "What’s really more infuriating about Harvard recently is the way it has treated the Boston neighborhood of Allston, which is directly across the river from Harvard. When they released their plans to expand the Harvard campus more seriously into Allston last January, it was clear they’d never approached community leaders in the neighborhood for real input, and a year later still have not. They act as though Allston is a big parking lot, and not a vital part of the urban landscape. Harvard says it will create 14,000 jobs by building in Allston…in 50 years. So that’ll be great for the Brazilian, Korean, and Russian immigrant communities there…or not, since they will all have been priced out of the neighborhood 45 years prior. It’s as though Harvard administration believes that having any association with their esteemed institution is an honor. Like residents of Allston - one of the few mixed commercial/residential neighborhoods that is home to recent immigrants and multi-generational Boston families both - should be honored to share a street with Harvard. Anyway, on an up note, Larry Summers was run out of Cambridge and replaced by Drew Gilpin Faust as president of the university like about a year ago. And I guess - from what I be reading in the paper - she isn’t all about trying to get blood on her fangs, and may be taking it slower as far as Allston is concerned. Of course, I’ll take that with a grain of salt though because the school has continually proven to be a bad neighbor for a long time." In a reversal from previously reported plans, Harvard has decided to do the right thing for our environment and natural resources, keep its 99 acre forest in Hamilton, and thereby spare it from development. 457 Cambridge Street - Confirm the legal occupancy as a three-family dwelling and renovate. Creation of a 500 car, 5 floor parking garage in the former Seminary land, for a total of 863 on the parcel. There are presently 788 parking spaces, of which approximately 200 are currently used. Relocation of St. Thomas More Drive's outlet onto Comm. Ave farther East (towards Boston). Relocation of the BC "T'" stop farther East, in the center of Comm. Ave, with widening of the street (and consequent loss of natural features and trees) on both sides of this Greenspace Overlay District. In tonight's State of the City address, Mayor Menino will announce a $1 million program "to coordinate the programming of schools, branch libraries, and community centers to boost test scores and graduation rates in the school system while decreasing dropouts and youth violence." The City clearly isn't awash in extra money these days, but it how much can $1M program do to improve the services of these city departments that will spend $830 million this year? Another way of thinking about it - there are 87,000 school-age children in Boston ranging from nursery school to grade 12. $1M divided by 87,000 is $11.50 for each child in Boston. You can't buy much with $11.50 and unfortunately this "miracle proposal" does not seem to propose any new services or programs. The Globe explains that a "school that had to cut music or art classes because of a lack of funds could ask the neighborhood community center or library to offer the class." Conceivably a school principal could already make this request, but how will the community center or library pay for the music and art class? City-wide, one million dollars is not going to provide too many art, music, or sports programs. Anyway, having schools unable to afford art and music and outsources these programs to the neighborhood library or community center doesn't seem like much of a solution. The real solution would be giving the school the money to reinstate the music and art classes! The time, logistics, and cost to get kids from one school to somewhere else and back to school is alone enough to make clear why these programs during the school day should be offered in schools, not somewhere else. For some historical perspective, the major announcement in last year's State of the City address (links for: press release, speech, video) was the City's commitment to spend $6M to restore the Strand Theater in Dorchester. What's the deal with this year's major initiative being so much smaller than last year's? If this is any indication of our city's fiscal problems we better see some huge new revenue real soon. The discussion about density, transportation, and parking happening over at the Allston/Brighton North Neighbors Forum makes these three stories particularly relevant. A local resident who doesn't own a car writes about biking through the winter, a bike-sharing program starts in Cambridge, and the CEO of Zipcar talks about car-sharing. "The same city planning and zoning standards should apply here as they would in any neighborhood. Otherwise, luxury condominium towers that threaten historic buildings and that violate zoning laws would be rising throughout the city, from Charlestown to Readville, as a putative mechanism to subsidize affordable housing. That this is not the case raises questions about the ad hoc nature of city planning in Boston, and how your zip code, rather than the rules on the books, can shape the fate of historic buildings and development on your block." At about 12:45am, on Saturday, January 12, 2008, officers from Area D-14 (Brighton) responded to a radio call for a person stabbed in the area of 26 Allston Street in Brighton. On arrival, officers located two males in front of the location both suffering from apparent stab wounds. Both victims were transported to area hospitals where they were treated for non-life threatening injuries. At about 3:10am, on Saturday, January 12, 2008, officers from Area D-14 (Brighton) responded to a radio call for a person stabbed in the area of Linden and Pratt Streets in Brighton. On arrival, officers located three individuals (two males and one female) all suffering from apparent stab wounds. All three were transported to area hospitals where they were treated for non-life threatening injuries. The last day to register to vote for the Massachusetts Primary is Wednesday, January 16th. If you want to vote in the Primary, you MUST register by this date. January 16th is also the last date to change your party affiliation if you want to vote in a different primary than the primary of the party you are already affiliated with. For instance, if you are registered as a Republican, but want to vote in the Democratic Primary, you must re-register either as Unenrolled or a Democrat. You can always change your party again after Election Day, but if you want to vote in a primary you must be registered as either a member of that party or as Unenrolled. You can register to vote by mail with the form on the Boston Election Dept. website. The Harvard-Allston Task Force is “completely dissatisfied” with the $21 million community benefits package proposed by Harvard, and will meet separately with both the Boston Redevelopment Authority and the university to discuss possible last-minute changes. “It seems like some of these dollars do not accrue to our needs, but instead to exactions—mandated payments that don’t filter down to our local community,” Task Force chairman Ray Mellone said. One of the interesting questions raised at last night's Harvard Allston Task Force meeting is whether or not there is a viable partnership between the community and Harvard. The Harvard staff took umbrage at my assertion that, despite all the talk, there actually is no partnership at all. This was in the same meeting where Harvard staff said that after 2 years they are still trying to figure out how to allow community members to ride the Harvard shuttle ("we had a meeting about that just this morning" they told us) and that they can't find a way to allow limited public access to their athletic facilities without displacing their own students. It seems possible that most of the time not all of Harvard's 28 tennis and 16 squash courts in North Allston are being used. But if Harvard doesn't want the unwashed masses on their turf, that's fine. But what's not fine is claiming that we really are partners and "all in this together" while acting as if we are held hostage by an evolving set of unsolvable constraints (liability, security, etc.) that prevent this integration. At the same time, Harvard has established a virtual monopoly over the non-residential land in our neighborhood, and it is pretty well established that the general welfare of society may not be well-served if monopolies are able to exercise all rights that they had before achieving monopoly status. "two or more parties working to achieve common interests and goals"
Those sound great - close cooperation, joint rights, mutual responsibility, shared outcome - but also so distant from the current relationships that the community has with Harvard and the BRA. Admitting that our relationship lacks these attributes seems like a better step toward reconciliation than continuing to pretend we have something that we don't. University itself, and society benefit." We had a well-attended and lively discussion at last night's Allston/Brighton North Neighbors Forum. The presentation from the meeting can be downloaded from the ABNNF website. A demographic change in A/B? The Allston-based Brazilian Immigrant Center estimates that 5,000 and 7,000 Brazilians left Massachusetts and returned to Brazil in 2007. Reasons cited include a weak US Dollar (which means money sent back to Brazil is worth less), high cost of living (gas, housing), and concerns that immigration policies at the State and Federal level show little signs of liberalizing. Brazilian immigrants are a large and visible portion of the Allston/Brighton community (10-15% in some areas) and if this trend continues it would certainly change the neighborhood. Yale Plans to Increase Spending From Its Endowment, Will Havard Follow? Yale announced plans to spend an additional $307 million next year in income from its endowment. Yale's endowment is $22.5B and the Yale's $307M increase means Yale will use an additional 1.4% of its endowment. By comparison, 1.4% of Harvard's $35B endowment would be $478M. Yale will likely use this money to increase financial aid, increase the size of the Yale College by 700 undergraduates (13%), fund more science research, and make more course material freely available online. "As Harvard, for instance, pushes forward with its science center in Allston, neighbors worry about Barry's Corner, an area whose fate is almost entirely in the university's hands. For city officials, the greatest challenge is to find the right balance when the needs of universities conflict with those of their neighbors." "Loud, late-night parties do not make for good student ambassadors. And families often resent even the best behaved students, because their presence often drives up housing costs, especially in modest neighborhoods such as Allston." "The proposed BC dorms are meeting with stiff resistance from neighbors in the Lake Street area, who want to see the student housing built on the main campus - further from their own homes." But after a few months encouraging the BRA to do something bold with the Harvard Science Complex community benefits and getting a rather unimpressive response, this conclusion to the editorial came as a big surprise. "Mayor Menino, meanwhile, is using the colleges' desire to expand as his leverage to increase their civic commitments. He wants colleges to create major initiatives in public education, sports, and job training - initiatives far broader than the limited community programs that universities now offer. "I'm out of the pilot program business," Menino says." I don't see anything even close to a "major initiative" in the benefits agreement distributed last week by the BRA. The ABNNF proposal made bold suggestions to make a dramatic difference in education and public health. But the BRA rebuffed those suggestions as too big and too complicated. Maybe some day Harvard's "education portal" idea will become something great, but at this point it sounds like the kind of "pilot program" that the Mayor rejects. 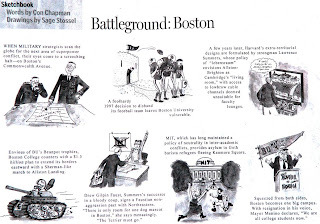 Today's Globe has a series of sketches by Sage Stossel and Con Chapman on page D3 making war-time metaphors about university expansion in Boston. They describe Harvard allying with Northeastern to eliminate BU, BC expanding to make up for its Beanpot hockey futility, and MIT offering asylum to refugees from Kenmore Square. Because they are professional satirists, do they get a free pass when they compare Harvard's policies with those of early 20th century Germany? Personally, I prefer a comparison with Jefferson's Louisiana Purchase. The New York Times has a new installment in its "Age of Riches" series examining the effects of the growing concentration of wealth in our society. This story is about the diverging fortunes of Yale University and the city of New Haven, CT. In many ways the same story could have been written about Harvard and its neighbors, though there are also key differences. Most of Harvard's land in Allston & Brighton continue to sit empty or underused. But in New Haven, Yale "employs two people full time to recruit boutique retailers in New York and Boston as tenants on spruced-up streets" and "biotech start-ups, restaurants and stores now occupy Yale-owned buildings." Like Harvard is the only major corporation here, "There are no corporate citizens left in New Haven except Yale,” Mr. Levin, the university president, said. And New Haven, with limited state and federal help, is languishing while it tries to move forward with transportation improvements to its airport, commuter rail, and bridges. Yale is helping with smaller things - "$10 million to repair bridges, streets, lights and sidewalks in the neighborhood", but that is hardly enough to move forward major infrastructure projects and isn't much compared to the $400 million annually that Yale spends on its own campus. Yale can't be solely responsible for the future of New Haven. At the same time, the heightening contrast between the campus in the midst of a renaissance and a run-down community isn't good for either. The Globe asks: "Fun on Storrow - why not?" "Let's concede the point that no feasibility studies have been done on von Tscharner's idea. No one knows the traffic impact, the number of police officers needed, or the compatibility of closures with the repair work. But surely most motorists using Storrow Drive on Sunday mornings are going into, not out of the city, to church, perhaps, or brunch. With the eastbound lanes open, their travel won't be affected. The tunnel will be repaired at night, so closures should not interfere. At this quiet time of the week, overseeing the closures should not be too difficult for the police. Our advice to DCR is simple: Do the study and, unless an insurmountable obstacle arises, give the closures a try." The Allston Brighton Community Task Force will hold meetings in January to provide Allston-Brighton residents with the opportunity to provide their comments and concerns about Boston College’s proposed ten-year Institutional Master Plan. All meetings will begin at 6:30 and will be held at Brighton Marine at 77 Warren Street. Copies of Boston College’s Institutional Master Plan Notification Form are available at local branch libraries in Allston-Brighton and at the O’Neill Library at Boston College. The plan also is posted on Boston College’s Institutional Master Plan website at www.bc.edu/imp. Forbes.com has an early review of President Faust's new book "This Republic of Suffering: Death and the American Civil War". She kicks off her book tour with a lecture and book signing on Wednesday at the National Archives in Washington, DC. Faust made a career studying conflict as it manifested itself during the Civil War. Now she has the opportunity to influence, among other things, the local (and of course much smaller and less violent) conflicts that Harvard tends to create with its neighbors. President Faust recently said, "For the last several years, the university leadership has been in transition. I can own a project and look at it in a deliberative way. . . . We're looking at everything again." What does that mean? How does she intend to "own" a project in a way different than Rudenstein, Summers, and Bok? She hasn't come to Allston and talked with people here about Harvard's expansion or said much of anything about Allston in public, so for now nobody knows for sure what that means. Just as she makes time to talk about her scholarly work on a trip to D.C., neighbors and I hope she will find the the time and justification to visit Allston. One plausible way a scholar of history and conflict might look at situations that have historically given rise to conflict would be to seek to minimize future conflict and the ensuing damage it can do to all parties involved. Honestly, I don't see the belligerence in that reasoning. To the contrary, I consider it a hopeful and optimistic attitude that there can be better relations between Harvard and Allston and that, in the grander scheme, someday other institutions might look positively on Harvard (the way UPenn is now considered) when they consider their relationship with their neighbors. If the tone of my original post did not sufficiently express any of that, I hope this additional viewpoint sets the record straight. The Globe published two letters today from people opposed to the proposed Sunday morning closure of the westbound lanes of Storrow Drive/Soldiers Field Road. One is from a Belmont resident concerned about her commute to church in Boston. One thing to consider is that the closure is proposed to end at 10:30 and only affect the westbound lanes. So her trip to church would be unaffected and her trip home would only be affected if she is driving home before 10:30. According to Google Maps, the fastest way to get from downtown Boston to Belmont doesn't use Storrow Drive at all. Taking the Mass Pike to Newton is a 21 minute trip, Storrow Drive to Route 2 is a 25 minute trip, Mass Ave to Concord Ave is a 25 minute trip, and using the Longfellow Bridge to Broadway and Concord Ave is a 27 minute trip. Maybe this these lane closures are a bad idea and the negative impact would be greater than the benefit, but let's understand the impact using facts instead of a small sample of anecdotal opinion. Federal campaign contributions, being much more transparent than local contributions, are online for all to see at politics.nytimes.com and elsewhere. In honor of tonight's Iowa Caucus, here is how A/B residents donated to presidential campaigns as of 9/30/07. Allston (02134): $13,655 total. $7,700 to Clinton and $3,355 to Obama. Only $1,950 (14%) combined to Republican candidates. Brighton (02135): $37,966 total. $19,011 to Clinton and $7,010 to Obama. More $ to Republicans (22% of total), almost all of which went to Romney, who got $5,950. All through last night's Celtics-Rockets game Tommy and Mike kept mentioning a player for the Rockets named "Allston". Alas, even though Celtics Blog - Boston.com and some other sources spell his name with two L's, it seems that Rafer Alston is one L short of being another namesake of the famed painter Washington Allston. I tried the baseball, football, and basketball archives, looking for players named Brighton or Allston and found a lot of Alston's who made it to the big leagues (even one in the Baseball Hall of Fame) but there apparently still a 'first' waiting to happen. The Boston Landmarks Commission is meeting on Tuesday the 8th at 5:30 in City Hall room 801. A demolition delay hearing is scheduled for 6:50 for the proposed demolition of 43-45 Murdock Street, Brighton. According to the City Assessing website, the property is owned by Newton resident Dr. Arni Mohan who also owns 697 Cambridge St where he practices psychiatry. For more info call the Landmarks Commission at 617-635-3850. The Charles River Conservancy has proposed closing 5 miles of the westbound side of Soldiers Field Rd / Storrow Drive on Sundays from April to November. The proposed closure would be mornings from 7:30 to 10:30 a.m and would start at the Herter Park parking lot in Brighton and continue to the Longfellow Bridge. The Department of Conservation and Recreation was noncommittal in its comments to the Globe and the Mayor's office did not comment. The support of our State officials (Moran, Honan, Tolman, and Galluccio) will be key to getting this approved. The DCR email address is mass.parks@state.ma.us and other ways to contact them are on its website.